At 11’ long and 38” wide, the Angler DLX by Imagine Surf makes for a very stable fishing platform. However, what makes this stand up paddle board even more useful is the fact that it is inflatable. That means it is portable enough that you can take it wherever you want to go fishing and you never have to worry that you won’t have enough space for it. Although it is inflatable, which makes it light and portable, the Angler DLX certainly doesn’t skimp on angling specific features. 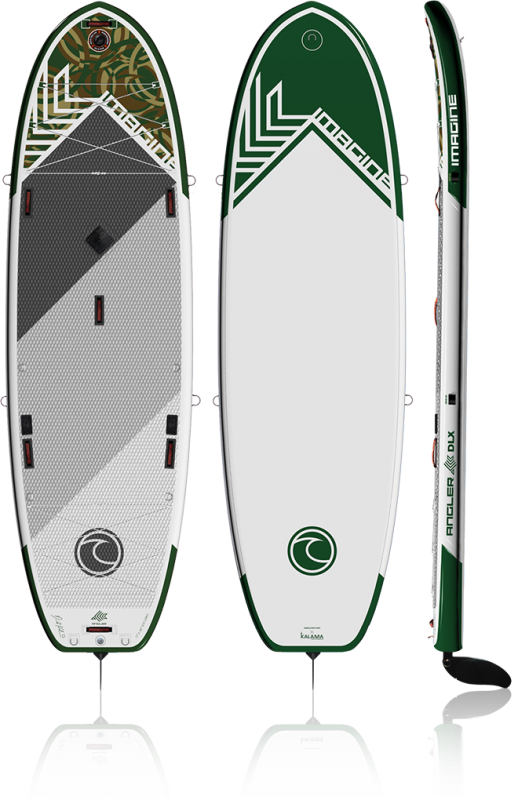 It is not just a flimsy inflatable stand up paddle board either, thanks to double side-wall rails this board has great stiffness and durability. It also features cargo bungees at the front and rear of the board, which makes it easy to conveniently stow your gear. Anglers will also appreciate the universal mounting plates as these enable you to attach accessories, such as fishing rod holders and more with ease. The Angler DLX has a diamond groove brushed eva deck-pad, so it not only provides great traction, but also results in a very comfortable ride. With this board there is also no risk of over-inflation as it has an automatic relief valve to prevent this issue. In addition, thanks to the tool free snap-in fin system of the board, it just takes a few seconds to install a fin. Imagine Surf has alto thought of all the extras when it comes to the Angler DLX, so it comes equipped with a selection of all the essentials. 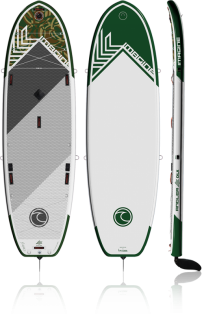 Included in the package is a high-pressure two-way pump to get the board inflated in no time as well as an Aluminum Harbor Paddle. Best of all, it comes with a Convertible Wheelie Backpack, which has stowable shoulder straps, internal compression straps and smooth rolling wheels, so you can carry the board, paddle and pump with ease.